The Emory Department of Surgery's Global Surgery Program was one of the first American Board of Surgery-approved international surgical training experiences. In addition to the options described below, the program continues to expand and formalize, with the eventual goal of becoming a global surgery track within the residency training paradigm. As an increasing number of Emory Surgery trainees pursue opportunities and careers in global health, they are also establishing their own global outreach efforts. For example, PGY-2 resident Erica Ludi is working in collaboration with Northwestern University and the Bolivian government to improve and develop the trauma and 911 reporting system in Santa Cruz de la Sierra, Bolivia. Read the story here. 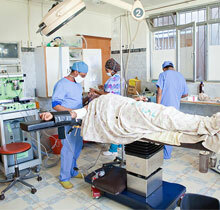 The founding director of the Emory Global Surgery Program was Jonathan Pollock, MD, and he initiated its first outpost in 2011 at Soddo Christian Hospital in Soddo, Wolaita, Ethiopia. Dr. Pollock managed the Soddo rotation onsite for nearly five years. Soddo Hospital partners with the Pan-African Academy of Christian Surgeons (PAACS) as one of nine PAACS academic centers that train national doctors over a five-year surgical residency program. To reverse the trend of Ethiopian residents training in international programs and not returning to their homeland following graduation, PAACS stipulates that graduating residents must agree to practice in-country for five years. The Soddo Hospital site remains an option for Emory Surgery PGY-4 residents to complete a formal six week rotation. The Emory Global Surgery Program recently joined the Consortium for Academic Global Surgery Programs of the American College of Surgeons Operation Giving Back program. OGB is working to create training hubs around the globe to serve as centers for training surgeons, developing collaborative research projects, and fostering innovation, and the first of these is located in Hawassa, Ethiopia. Emory's team was the first group to visit the OGB training center in Hawassa in January 2019. It is anticipated that this multi-institutional collaborative will become highly popular with trainees interested in international service and training, and will contribute much to Emory Surgery's tripartite research, clinical, and educational missions. 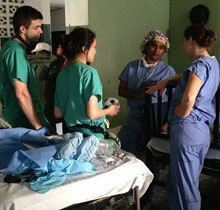 Emory Haiti Alliance team members on patient rounds. The Emory Haiti Alliance is a volunteer consortium of Emory anesthesiology, general surgery, oral and maxillofacial surgery, and urology faculty and residents; medical students; and mid-level practitioners. Encompassing approximately 40 members, the alliance has been making summer surgical trips to Haiti's Central plateau — the most medically underserved area in the country — since 2008. The alliance is currently partnering with Hopital Bienfaisance and Promise for Haiti in the town of Pignon. The trips last one month, and involve a core-team of fourth year Emory medical students in place for the entire four weeks, while surgical teams rotate in and out of the country in three one-week intervals. Residents have the opportunity to join the trip for one or more weeks. While general surgery residents currently do not receive credit for participating in this outreach effort, the Haiti trip offers an excellent opportunity to gain global surgery experience, develop leadership skills, exercise independence in the operating room, and learn how international and rural hospital systems work on the most fundamental level. Emory Surgery is currently in the planning phase of transitioning this program to be an approved clinical training experience, though the parameters of the Haiti effort make it vastly different from the Ethiopia program.